My daughter came running one evening and shouted "Let us read the Musicians!". I had no idea what she was talking about. I asked her "Which book?". She gave a disdainful look that only daughters can and said - "What? You do not remember the musicians book?". I regretfully had to say "No!" and she got wild and went away angry. She kept coming back every few minutes asking if I had found the musicians book. Finally she found the book herself and said - "Silly(the equivalent in Tamil of course!). Here it is". Smack! 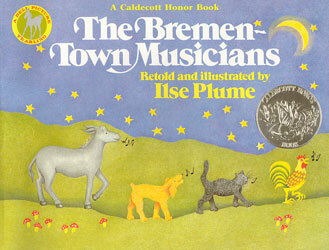 She was of course talking about the book 'The Bremen Town Musicians'. We had borrowed this book from the library the day before this incident and read it that night and she could not get it out of her mind. I guess that conversation is the review of the book by itself. There is no need for glowing reviews, when the intended audience cannot stop talking about it. To be fair, I did not enjoy the book that much. It did not grab my attention - but, it did for the most important person - our daughter. With multiple readings with her in a day; it slowly started growing on me too. A miller who owns an old and faithful donkey is tempted to turn away his donkey as it is too old and he could save some expense of feeding this old beast. 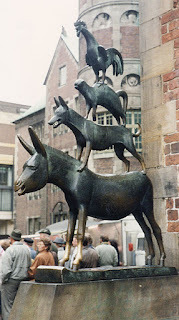 Knowing this the donkey decides that since she has a wonderful bray, she will try her luck as street-side musicians in the town of Bremen and off she starts on her journey. On the way she meets a few other old and now useless animals to their masters - a cat, a dog and a rooster. 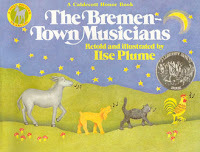 They all decide to team up and head to the town of Bremen. On the way, they see a lonely house, inhabited by a band of robbers, and decide to stay there for the night. Assuming that they can entertain their folks in the house, they stand over one another and start their music - "Bray, meow, bark and crow!" The robbers get the fright of their life and run for their lives! The story is by Brothers Grimm and wonderfully adapted by Ilse Plume. This story is so famous that there is an statue of these animals in the town of Bremen. Amazing, isn't it? Image src: The Wikimedia and Ilse Plume. I just showed the pic of the book (which you have put up here) to S and asked her if she remembered it ! She said "Yeah..it is the music book "
I love the sound of your family chorus! Playing by the Book - Thanks. We can definitely create a great ruckus!! Adding to the chorus re your family chorus! We used to have this story in our middle school English textbook, so brought back some memories Sathish. LOL! 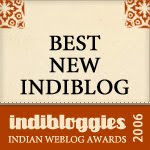 I love the way you tell this tale, Sathish! I read this often as a kid and for some reason enjoyed it thoroughly. I guess it is truly a kids' book if we cant see the merit in it. Chox, Praba, Vibha - Watch out for the R&S family band! the loudest one in the town!! Mad Momma - Thank you. I did not realise it was a Grimm's tale till recently. sometimes the magic of the story is in the narration...and i am sure yr kids have that..